2009 NJCAA National champion Salt Lake Community College will host the Region 18 Men’s and Women’s Basketball Championships at the Bruin Arena on the College’s Taylorsville Redwood campus. The tournament winner will advance to the National Junior College Athletic Association Championship. In the past 10 years, men and women’s junior college basketball teams from Region 18 have won four national championships and have had two second-place finishes. In the past 10 years, men's and women’s junior college basketball teams from Region 18 have won four national championships, two second-place finishes and eight teams have qualified for the ‘Final Four’ of the national tournament. 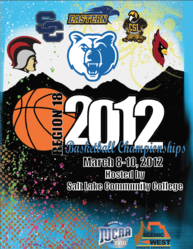 2009 NJCAA National champion Salt Lake Community College will host the Region 18 Men’s and Women’s Basketball Championships at the Bruin Arena, Lifetime Activities Center on the College’s Taylorsville Redwood campus. Along with Salt Lake Community College, North Idaho College, the College of Southern Idaho, Utah State University’s College of Eastern Utah, Snow College and Colorado Northwestern Community College will participate in the Region 18 tournament. The tournament winner will advance to the National Junior College Athletic Association Championship. The three-day tournament will begin March 8; tip-off for the first game is scheduled for 2 p.m. The Region 18 basketball tournament is among the most competitive in the country; over the last 10 years, men's and women’s junior college basketball teams from Region 18 have won four national championships, two second-place finishes and eight teams have qualified for the ‘Final Four’ of the national tournament. In 2009, SLCC won the men’s national championship, rallying from a 15-point deficit in the final 11 minutes. In 2008, SLCC was the runner-up.